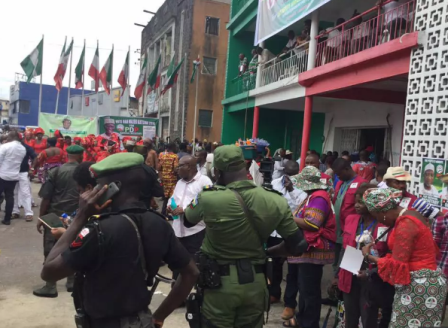 Recall that PDP National Convention that was held in Rivers State on Wednesday, August 17, was disrupted after the main venue for the Convention which is Sharks Stadium in Port Harcourt, Rivers state, was sealed by the Nigerian police. PDP has since been embroiled in leadership crisis as Sheriff has refused to step down insisting he remains chairman of the party. To make matters worse, two separate courts gave conflicting judgment on who should be the chairman of the party. While Justice Okon Abang of the Federal High Court, Abuja on June 30, affirmed Sheriff as chaiman, a Federal High Court in Port Harcourt, presided over by Justice Abdullahi Liman, affirmed Makarfi as chairman. The party now has two factions, one led by Sheriff and the other led by Makarfi. While Makarfi has the back­ing of PDP governors, Board of Trustees (BoT), National As­sembly caucus, the state chair­men and stakeholders of PDP, Sheriff is enjoying the support of some lawmakers, some for­mer governors, some sacked National Working Commit­tee (NWC), members and also some stakeholders of the par­ty. From the look of things, the crisis rocking the party won’t be ending anytime soon as the party is engrossed in no fewer than 15 court cases, all relating to the struggle for supremacy. According to Naij.com Below are some reasons why the PDP national convention failed to hold at the Port Harcourt stadium as planned. 1. 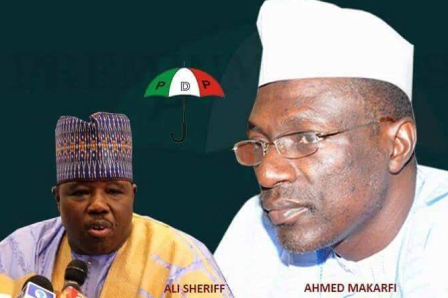 Conflicting court judgment: After the Makarfi-led faction announced August 17 for the party’s national convention, Sheriff’s faction filed an interlocutory application, asking the court to stop the party from going ahead with the planned national convention pending the determination of their substantive suit. On Monday, August 15, a Federal High Court in Abuja ruled that the convention should not hold. Justice Okon Abang granted an interim order suspending the convention pending the determination of the application filed before him on July 20. On the other hand, a Federal High Court in Port Harcourt gave a comprehensive Order, specifically ordering the PDP to proceed with the convention as scheduled without hindrance. 2. INEC confused: Following the conflicting court orders, the Independent National Electoral Commission was thrown. The commission was confused on whether it should monitor or stay away from the national convention. Justice Abang of the Federal High Court in Abuja, warned the INEC chairman, Prof. Mahood Yakubu, not to monitor the convention while Justice Ibrahim Watila of the Port Harcourt division of the Federal High Court asked INEC to monitor the convention. The conflicting judgments put the commission in a state of confusion. 3. Ali Modu Sheriff’s determination to remain in control: The ousted chairman is one the party’s greatest misfortune. He is determined to remain chairman of the party, insisting his tenure ends in 2018. Despite pleas and moves for reconciliation, Sheriff remains unyielding. He has been fight the leadership of the party with everything he has and all efforts to broker peace between him and Makarfi has hit a brick wall. 4. Police intervention: In the early hours of Wednesday, August 17, the Nigerian police sealed the venue of the national convention, Sharks Stadium in Port Harcourt, Rivers state. The Rivers state government house was shut down by police officers purportedly acting on the orders of the Inspector General of police. 5. The party is divided like never before: Some have described the convention as illegal and a number of the PDP members are not in support of it. Some are of the opinion that the party should have reconciled aggrieved party members before fixing a national convention. At the moment, the party has two factions. Today’s convention may further tear the party apart.